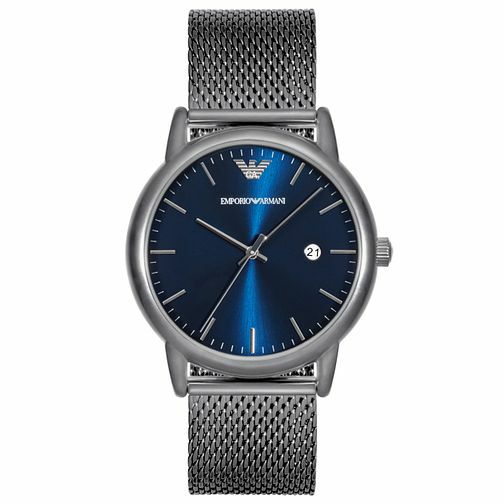 Designed by Emporio Armani, this men's timepiece is overtly masculine and inherently stylish. Featuring a colour palette of a ion plated case and strap and deep blue dial with date window, this watch is designed with style in mind. Emporio Armani Men's Ion Plated Bracelet Watch is rated 3.0 out of 5 by 2. Rated 5 out of 5 by Anonymous from Cracking watch Elegant and fashionable watch to wear with anything, great value too, love it. Rated 1 out of 5 by Anonymous from One size DOES NOT fit all This watch is described as a mens watch but it does not fit the hands of a average sized 21 year old let alone a bigger size man.